I got an opportunity to work with Dr. Christin Taylor Murphy photographing Sprouts, a harbor seal (Phoca vitulina)and Rio, a California sea lion (Zalophus californianus) for publication. I have worked with sea lions and northern elephant seals (Mirounga angustirosus) in the past at as a volunteer at The Marine Mammal Rescue Center. There it was mostly malnourished pups and sick or injured adults. I’d never been around fully grown adults. It’s incredible to be mere inches from these powerful animals. For all the awkwardness they exhibit on land, their grace in the water is astounding! They’re highly trained, but there’s always the awareness that you are dealing with a very large, very powerful predator. Ultimately when you’re in the pen with them, you are in their world! If you look back at those photos you can see Rio’s ear flaps behind her eye. There are a lot of differences between them, how they walk, swim, feed their young, breed, and live out their lives. If you want to know more about that, Noaa has a reasonably good comparison. They use their whiskers to follow the wake. Whenever something moves through a fluid it displaces the liquid and creates turbulence behind it. 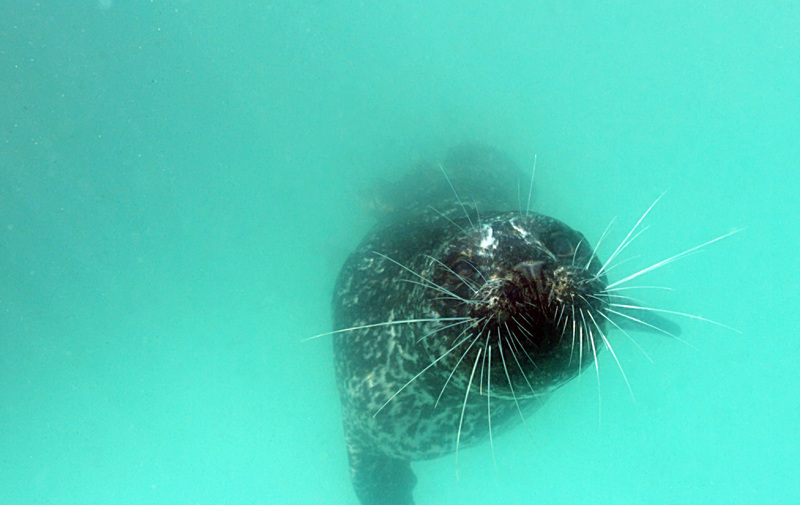 The seal is able to detect the turbulence by changes in the vibrations of their vibrissae (whiskers). As you can imagine, the researchers have to make sure the seal can’t see when underwater so Sprouts and Rio got a sponsorship from Hotline Wetsuits! Dr Murphy spent two years working with these seals and training them so they could take a test and let her know what they knew. It’s a bit like a masters only with fish as the reward instead of a diploma. That being said the animals enjoy working. As carnivores, they are highly goal-oriented in the wild and get bored without problems to solve. I came and helped by providing photo documentation, editing and video editing support. I also got to work with phantom video shot by the discovery channel, processing and rough editing footage from raw… It is nothing short of gorgeous! I want to get my hands on more of it someday! 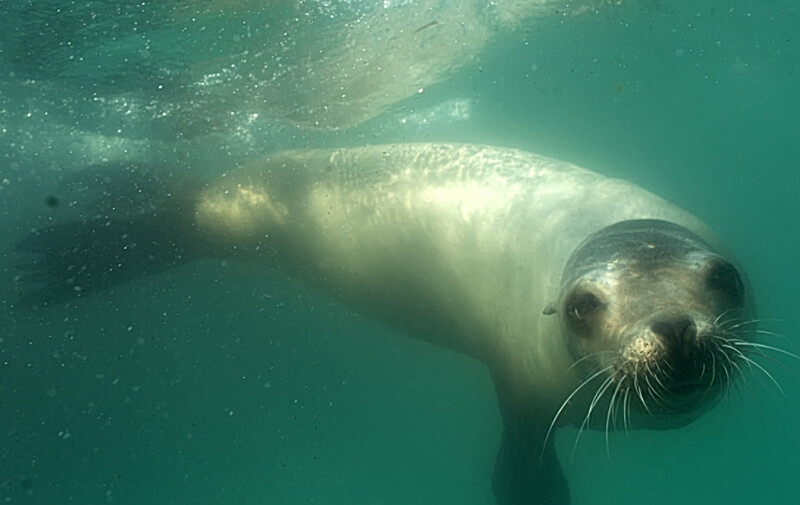 PLOS ONE: Effect of Angle on Flow-Induced Vibrations of Pinniped Vibrissae. Looks like another opportunity to utilize multiple of you myriad of skills. I believe that the anthropomorphism in science is an artifact left to us by the primitive vie towards animals inherent in a Christian ethos. The system of “science” we worked in up until June or July was negatively affected by our emulation of the British Natural History model, which called for us to thrash loudly through the forests killing as many specimens of unknown species as possible, then attempting to determine their lifestyles and how their physiognomy functioned ex situ. Some of the reason as well is historically cog. sci. people though that the presence of a neocortex was required for self awareness. The thrust of the Cambridge Declaration on consciousness is that it is not required. © 2016 M. Matthias Elliott, all rights reserved.